While some USD students viewed Monday’s remembrance of Dr. Martin Luther King Jr. Day as a free day from schoolwork, more than 35 student volunteers used this day off as a “day on”. Students met in the morning to hear speeches about King’s life and legacy. In the afternoon, they spread out to 11 different volunteer opportunities across Vermillion and Yankton including service at St. Agnes Catholic Church, the Welcome Table, the Vermillion Public Library, SESDAC, Center for Children and Families, the Recycling Center, Newman Center, Sanford Care Center, the Vermillion Food Pantry and the Pathways Shelter for the Homeless and River City Domestic Violence Center in Yankton. Allie Logan, a first-year graduate student in public administration and the graduate assistant for AWOL, said it’s easier on their community partners when volunteers help on a Monday as opposed to the weekend. Logan said it’s personally very important to her, and to others in AWOL, to give back to the community through volunteering. “Going out into the community helps people become aware of what the issues are in their community and helps them get to know the community,” she said. Laura Renee Chandler, CDC director, and Rich Braunstein, a professor of political science, each spoke in the morning. Chandler spoke on the distinction between non-violence and King’s philosophy of nonviolent action. Braunstein’s speech focused on trauma-informed approaches to public safety, such as training police and working with communities. He said he wanted his speech to share the linkages between Dr. King’s work, and how it remains relevant to today’s work. Blessed Vargas, a first-year elementary education major, said he enjoyed the speeches and was looking forward to volunteering at the Vermillion Food Pantry. Sierra Kamin, a sophomore criminal justice and psychology double major, said she was really interested in the morning’s speeches. Kamin served at Pathways Shelter for the Homeless in Yankton in the afternoon and said she was looking forward to the experience. 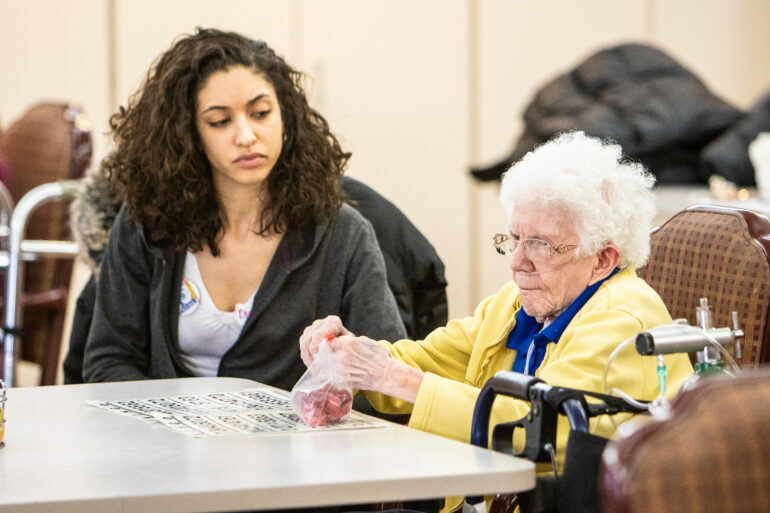 “I have volunteered here and there, but never anything as big as this or in this big of a group, so I think that it will be really exciting to see what happens throughout the day,” she said. Kamin said she also gained a lot of knowledge from the speeches, especially on trauma-informed policing. “Eventually I want to be a police officer, so I thought it was always really interesting to hear what (Braunstein) had to say and learn how to apply it here, and make tensions between community members and police officers less tense, and try to figure out how we can make a more equal world and have a more equal justice,” she said. Upcoming events for Dr. Martin Luther King Jr. week include a Spoken Word event on Tuesday night; Lunch with King on Wednesday; a musical performance on Thursday evening and a screening of Selma on Friday night.